One thing that many of you don’t know about me is that I love to cook (LOL) AND to preserve. To me there is nothing that says I love you more than preparing those special meals and treats for my family. Canning is easy, but it is time consuming and you do have to follow sterile rules to make it safe. You can be as plain or as inventive as you want. Hubby pointed out this would be a good time to share my award pictures that I began to scrapbook about before the move and have yet to finish. I always thought it a little ironic that I was ‘preserving’ my preserving ribbons. Here are a few pictures. How I got started on entering the county fair is actually a cute story. I was still working for a major phone company and I make a Spiced Pear jam that really is awesome. We had a cafeteria in the building I worked in and the engineers would stop by my desk to buy a jar of jam before their coffee break so they could put it on their pancakes and waffles. I loved making it and only charged them enough to actually cover my expenses so I could make more.My boss kept trying to get me to enter it into competition, but I was reluctant as I really didn’t think I had what it took to compete against women who had been doing it all their lives (1 woman had an entire 4×8 foot wall with just her entries and had been winning 1st and 2nd place awards for over 20 years) because I was a self-taught newbie and ‘shy’. Unbeknownst to me, one of the guys entered me in the upcoming county fair. He knew I went every year to drool over the jams and jellies and crafty items in the home building. You have to picture my jaw actually dropping to the floor on this particular year when I see my name, my jam and an actual 3rd place ribbon attached to it! I was literally speechless especially since I hadn’t entered the fair. Long story short I will always be eternally grateful to him for giving me the courage and confidence to enter each and every year after that for 10 years until I moved away. I have also been published in several of their cookbooks for the years I won first place. I hope to start again soon.This year I want to try my hand at some of the local indigenous fruits (cranberries, blackberries, blueberries and apples to start). Shannon from Moments of Introspection gave me this great award. I am blessed with being an Ovarian cancer survivor. I love to play Mexican train. I love getting a good pedicure. I love meeting people through blogs. I am a patient person, but can’t sit and wait well. Here’s where I deviate a bit: I nominate all my favorites, you know who you are!!!! to jump in and participate! Aw, shucks, we’re blushing. Thank you! 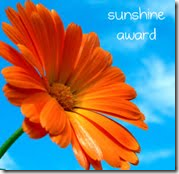 Deirdra from A Storybook World is our newest follower and has given us this beautiful award. 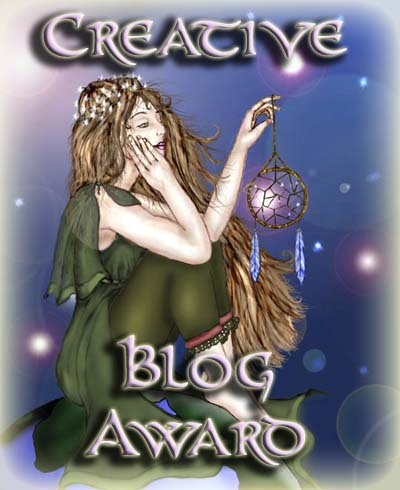 She is also an author and illustrator and made some awards to give to fellow bloggers whose sites she enjoys. We were pleased to receive one. She has such beautiful talent. Be sure to stop by and see her beautiful blog. Thanks again Deirdra for this beautiful award. Aw, shucks, I’m blushing. Thank you! Deirdra from A Storybook World is my newest follower and has given me this beautiful award. She is also an author and illustrator and made some awards to give to fellow bloggers whose sites she enjoys. I was blessed to receive one. I am so awed by her talent. 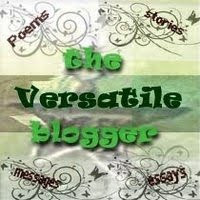 Be sure to stop by and see her beautiful blog. Thanks again Deirdra for this beautiful award. We’re blushing yet again, twice in fact thanks to The Overloaded Mommy and what a way to celebrate our birthday yesterday! Thank you Casey! •Thank the blogger who awarded it to you, which we sincerely do. •Sum up your blogging philosophy, motivation, and experience using five (5) words. •Pass it on to 10 other blogs which you feel have real substance. That’s all of you. We are also extremely grateful for our loyal followers, commenters and our wonderful creative cooking crew here at OUR KrAzY KiTcHeN and pass this award along to all of you! There are “rules” for this award, but since we are a co-op so to speak we are bending those a bit. 1. Thank the person who gave you this award. Which we do profusely. 2. Share 7 things about yourself. How about 10? We’ll give you the 10 people who make up this blog and their home sites. JEN~The Misadventures of Mrs. B! 3. 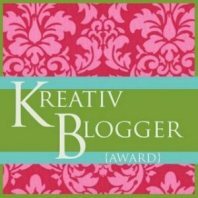 Pass the award along to 15 bloggers who you have recently discovered and who you think are fantastic! That’s all of you. My very dear friend Diana from Forgetfulone wants me to share deep dark secrets with you and she also wants me to actually lie. You heard me she wants me to lie. Those of you who know me in person know that I am a notoriously BAD liar. MY sweet SIL has been trying to teach me, but she’s says it’s hopeless. Let’s hope that doing it in writing comes easier for me than face to face. 1.Thank the person who gave this to you. ~ Thank you Diana for trying to make me a Liar. 4. Tell us up to six outrageous lies about yourself, and at least one outrageous truth. 5. Allow your readers to guess which one or more are true. I won’t drive on the freeway. I always wear gloves when handling food. Be sure and leave a comment about which one you think is true and in a few days I will reveal the realities. I can’t wait to see what you all have to say. I can’t wait to see what you all have to say. Julie over at Mommie Cooks has honored us with this award. Can’t you see us blushing? Well, we are. We are also extremely grateful for our loyal followers, commenters and our wonderful creative cooking crew here at OUR KrAzY KiTcHeN and pass this award along to all of you! There are “rules” for this award, but since we are a co-op so to speak we are bending those a bit. Jennifer over at For Such A Time As This has honored us with this award. Can’t you see us blushing? Well, we are. We are also extremely grateful for our loyal followers, commenters and our wonderful creative cooking crew here at OUR KrAzY KiTcHeN and pass this award along to all of you! My very dear friend Chaya from Chaya’s Comfy Food and Sweet & Savory Says it All wants me to share deep dark secrets with you and she also wants me to actually lie. Those of you who know me in person know that I am a notoriously BAD liar. MY sweet SIL has been trying to teach me, but she’s says it’s hopeless. Let’s hope that doing it in writing comes easier for me than face to face. 1.Thank the person who gave this to you. ~ Thank you Chaya for trying to make me a Liar. I love reality TV and watch everything I can. I am a creature of habit and never rearrange my furniture because I have severe OCD. I have survived 2 earthquakes, a tornado and a hurricane. I prefer my laptop computer to my desktop. I have had many careers, but my formal training is actually in health education. I know several bloggers in real life. Playing Catch Up to start the year off right! I started blogging to relieve stress from working on a Victorian investment house that began to remind me of the old Tom Hanks and Shelley Long Movie, The Money Pit. I detest paid programming and infomercials. Most of them insult our intelligence. I’m a natural blond so it is okay for me to tell blond jokes. I once wanted to be a tree surgeon. I love to get dressed up, but am most comfortable in levis, a t-shirt and barefoot. I can’t stand floral prints on drapes. I love boxes of all sizes and shapes! My Virgo organizational qualities bleed through. I’m passing these awards on to some wonderful and inspirational bloggers, (but not nearly all the bloggers who deserve it) who I am proud to call friends. They have all touched my life in some way with friendship, laughter and encouragement that has helped me cope through tough and trying times this year whether they know it or not. 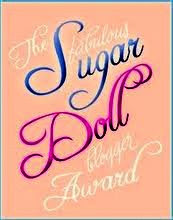 *Dave I do realize that these appear to be girlie awards, but you are a beautiful blogger and you earned the sugar doll by taking on puff pastry!